Hidden Figures could be summed up as The Help in space; while it differs from the 2011 drama in telling the true story of three unsung minds behind the 1960s NASA space program, the two films are close cousins in telling a civil rights story through a PG, “feel good” tone that sometimes makes it feel watered down and lightweight (in fact, the two films share an actress, Octavia Spencer, in a main role). Hidden Figures is enjoyable and occasionally moving and uplifting, but also sometimes feels like an “inspirational” Lifetime original movie bumped up with a bigger budget and a pedigreed cast. 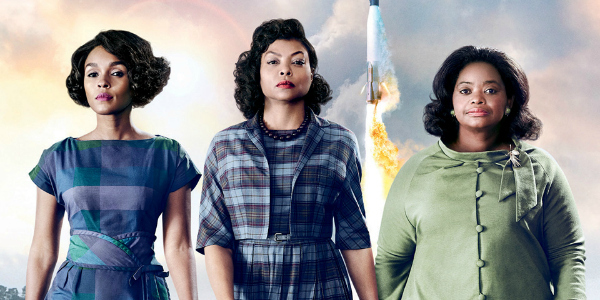 Opening in 1961 Hampton, Virginia, Hidden Figures tells the (mostly) true story of math prodigy Katherine Gobel (Taraji P. Henson) and her best friends and co-workers, take-charge Dorothy Vaughan (Octavia Spencer) and surly Mary Jackson (Janelle Monae), who work as human “computers” in NASA’s pre-electronic era. The racially segregated computers are a batch of black women, supervised by Dorothy, who perform the menial calculations allowing those in the engineer and scientist offices (populated entirely by white men) to plot orbits and determine safety margins for rocket launches. Katherine’s skills as a mathematician earn the notice of Al Harrison (Kevin Costner), the director of the Space Task Group, who gives her increasing access and responsibilities as John Glenn’s (Glen Powell) Earth orbit mission draws closer. Hidden Figures is an old-fashioned inspirational feel good docudrama about underdogs overcoming. The movie never pushes its tame PG rating, which holds it back from any “edgy” material, but it does an effective enough job at accomplishing what it sets out to do by showing the exclusivity of the 1960s white male power base and how three black women managed to break through the glass ceiling in a time and place where they were held back by both their race and gender. 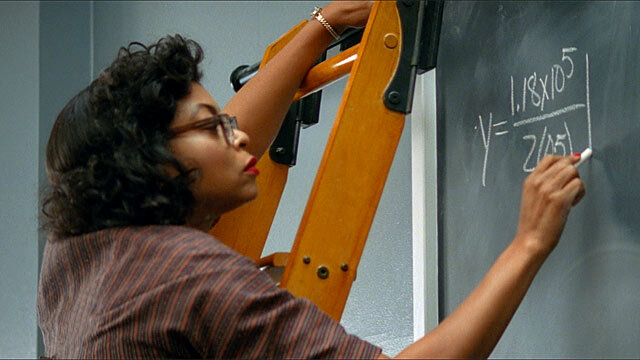 While it ostensibly tells the story of three “hidden figures”, Katherine is the central character and her storyline gets the lion’s share of screentime and focus. We get snippets of Mary and Dorothy’s lives, including Mary’s court battle to win the right to attend a segregated whites-only school to earn the needed credits to serve as a NASA engineer, and Dorothy working out the kinks in the new IBM machine which has so far baffled the white male “experts”, but the limited time spent on them comes off as obligatory and perfunctory. For all intents and purposes, this is Katherine’s story. She gets a little time devoted to her personal life, trying to balance her new heavy workload with being the widowed single mother of three children, and her budding romance with National Guardsman Jim Johnson (Mahershala Ali), who initially puts his foot in his mouth with his surprise at women working for NASA, but these domestic scenes are half-baked and underdeveloped, a descriptor that holds even more true for Mary butting heads with her husband (Aldis Hodge), whose lack of support, then turn-around, falls victim to truncated development. The movie is on stronger ground when it’s at work than when it’s away from it, and when it’s sticking to Katherine’s story. The PG rating and feel good, inspirational tone the filmmakers were aiming for leads them to play softball in their portrayal of racial bigotry, but the film does an effective job in conveying the lack of workplace equality and the various forms it can take, some more obvious than others. No one lays a finger on the three women or calls them names, but they endure pervasive passive-aggressive prejudice, such as Dorothy doing the work of a supervisor without the title or pay rate, or Katherine being mistaken for the janitor when first setting foot in Harrison’s think tank. While the three women have some sympathetic white supporters, including NASA mission specialist Karl Zielinski (Olek Krupa), who is no stranger to oppression as a Polish Jew whose parents died in the Holocaust, and eventually Harrison himself, Katherine finds a workplace nemesis in the form of snippy head engineer Paul Stafford (Jim Parsons), who plainly doesn’t think she has any business in his office and resents her correcting his math, passive-aggressively stonewalling her work by redacting information she needs to complete her assignments. The biggest hurdle comes with a flair of absurdist comedy, as Katherine must endure a long, time-consuming walk, rain or shine, all the way to the computers’ building half a mile away any time she needs to use the restroom, as the one situated close by her own work station is for whites only, leading her to be late completing assignments and earning the ire of her boss Harrison, who is initially oblivious to the reason for her lengthy “breaks”. Like The Help, it paints in broad strokes and hands down its history lesson in easily digestible, uncontroversial terms (although, as the closest thing we have to an antagonist, Jim Parson’s Stafford is at least more subdued and less cartoonish than Bryce Dallas Howard’s Hilly Holbrook). Theodore Melfi has assembled a pedigreed line-up, including Oscar and multi-Emmy nominee Taraji P. Henson and Oscar winner Octavia Spencer. This is Henson’s show first and foremost, unsurprising considering she’s given the central focus, and she delivers a similarly heartfelt, dignified performance to what Viola Davis brought to The Help. Her biggest spotlight moment, an office outburst halfway through, is the kind of powerful, impassioned acting that could put her in line for another Oscar nomination. Singer Janelle Monae is convincing in one of her first acting roles (in addition to this year’s Moonlight, which also featured Mahershala Ali). Supporting performers like Octavia Spencer and Kevin Costner are fine, but don’t get as much opportunity to stand out (Spencer and Costner previously co-starred in another film about race relations, 2014’s Black or White). While the three main characters are not developed equally, there is strong chemistry between the actresses, enough for us to accept them as three best friends. For his part, Costner, who was often a dull leading man, has settled nicely into these kinds of elder boss/mentor roles; Harrison is an unsocial man married to his work who is oblivious to the lack of workplace equality in his office until Katherine’s outburst throws it in his face. His response (taking a golf club to the “whites only” sign barring Katherine from using the nearby restroom) is a reminder that not every white person in the 1960s was a racist. The Big Bang Theory‘s Jim Parsons (playing it straight) and Kirsten Dunst (who hasn’t been a common sight in high-profile films since playing Spider-Man’s girlfriend) play two shades of casual racism; Parson’s Paul Stafford might not utter any racial slurs, but his glares and condescension speak plainly enough, while Dunst’s Mrs. Mitchell is less malicious but, like many products of their time, is oblivious to her own prejudices. Their characters aren’t exactly three-dimensional, but they’re also not painted with horns on their heads, but as flawed human beings rather than racist caricatures. When it comes to films about the 1960s civil rights struggle, Hidden Figures is a lightweight contender, but it shines a spotlight on unsung heroes of the space program and an example of talent and determination overcoming an unfair and repressive system. It goes down easily and pleasantly and might leave a smile on one’s face, even if it doesn’t linger strongly in the memory.